I have taken lots of photos during my build but not uploaded them yet. The webbit was my first ever build after taking this hobby up 6 months ago. I have enjoyed the build and found the covering by far the most challenging part and one I will seriously need to practice on. The colour scheme was based on my seagull yak 54 which had a close encounter with a tree a few weeks ago. I would be very interested in your comments good or bad. I will be taking the 'wasp' to the field in the next week or so. 1 - PATIENCE (I have a tendency to try to get as much done as possible then rush and make silly mistakes. 5) read the instructions first - I am not very good at this part. Any how I am really happy with the design but cannot help thinking my webbit is going to be a very heavy one with my big battery/ engine/servos etc. It seems a big ask for the little sc15 engine but hey we will see in the next week. I see your point regards the design. I have just been taxiing about with it and may be I was wrong. The engine seems to pull it about admirably. Looks superb Steve, especially as a first covering attempt. Very well done. You are right about the balsaloc, I only use it if I really have to. Looking very smart Steve, like Jo it reminds me of the Lotus 72. Cracking job Steve - a credit to you. If that's you're first attempt at building ist gone very well by the looks of it! Part of the point of the Mass Build was exactly to encourage folks like yourselve to have a go at building - and hopefully learn first hand that its fun and not as difficult as it sometimes looks. Enjoy your WebBit - fingers crossed for the maiden. Don't forget to put a picture in the "Finished WebBit Gallery" as well! Yup, looks great Steve, well done. Looks fantastic, a first class covering job! Yes guys it didnt look too bad, unfortunately the sc15 is not manly enough to get it off the ground. It appears I have built a remote control car in the shape of a webbit. My last chance is to cut the strip to see if I can get it rolling a bit faster for a take off. At least i have learnt a lot and my capiche build is progressing well. What a hobby!!!!!! Make sure you've got lots of space in front in case it doesn't want to climb and land straight ahead if it's too marginal. OH dear! What a pity. Thinking about it,....it might not just be the engine. Someone else was having trouble getting their WebBit to rotate - Grumpy Bill I think. How much does it actually weigh? Can you get the weight down? Smaller battery? Any ballast fitted? If so can anything be moved around to lessen the need for it? How big a tank have you fitted? Could you fit a smaller one? 1. Squeeze the main undercarrage together a bit and if poss lower the tail by bending the tail wheel wire up a bit. This will increase the wing's angle of attack on the ground. 2. Give it a tad more elevator throw - best to do this on a special "elevator high rates" switchable setting - you might not want it that high in the air! This will help a little with rotation. Worth a try - it just might give you that bit more upward urge you need on the ground. I am using a 15 size engine which is within the recommended size range but had similar problems to you. I think I've got it pretty much cracked now so I'll tell you what I did and hope it's of some help. 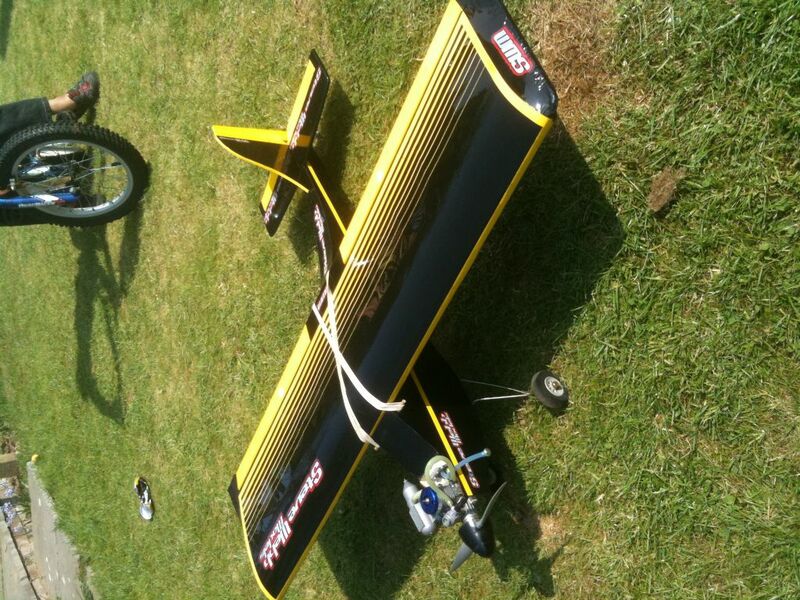 I started with an 8x4 prop which seemed to give reasonable ground speed but I couldn't get it to unstick. I had been somewhat generous with the lead on the front and after removing 50 grammes it did look like it might get away. This has taken it from slightly nose heavy to slightly tail heavy (and lively - see below). Next step was to experiment with some prop sizes. No 7" prop could make it roll but a 9x4 matched the 8X4 for ground speed and still managed just over 10k revs so I decided to have a serious go at it with that. It worked but I have to make a gentle initial climb out until the prop unloads then it's just fine. It seems to me that a wide prop is working better than an equivelant deeper pitch prop, I might see if I can get hold of 9x3 and see what that does for it. After I was looking at the plans again at home when I realised my tail wheel was holding the back end too high so I've gone from 1.5" wheels to 2.25" to improve the angle of attack available for ROG and that made a further improvement in breaking away from the ground; that was in flat calm so with a head wind there shouldn't be any problem. Re the CG shift mentioned above - I presume this is the cause of a fairly sensative elevator, now its all trimmed out and I've had a few flights I think I could stick with it but I was looking for a little more comfort with this model so currently I've reduced the throws by 10% on each of the rates settings and added 20% expo in the low rate, 25% in the high rate. This set-up is still lively but I can fly happily with it like that. I may add a little more expo to the high rate. Hah cross posted with BEB - great minds think alike eh? Oh! another thing - mine is black & yellow, wow, these must be like heavy colours man! I have learnt a lot from this build. I used the same rx battery pack as I do for all my planes. In hindsight I should have used a smaller pack but I have kind of built it in to the fuz so cannot change it. The tank is pretty small so I dont think that will help. I will cut the strip and look at the tail wheel height. The 9 6 is definitely no good and the 8 6 is marginal so I will try and get hold of some 8 - 4 and 9-4 props to see. I have to say though it was still a good project and has really got me excited about building from plans. I am almost finished the wings and aeleron's of the capiche which is more complicated and the lessons learnt on the webbit have been great. I will be trying a warbird next. Anyhow I am off to the strip to fly for a couple of hours before going to a wedding. The model looks amazing. I like that. The orginal WebBITs flew on Enya 15's - some like Paul Heckles were on the Ballrace TN 15 - I'm wondering about the power out put quoted on the SC 15. My reason is that I spoke to a customer of some years ( and modeller of even more years) and he had an SC15 in his and while it flew, he didnt get a good take off when trying an ROG. 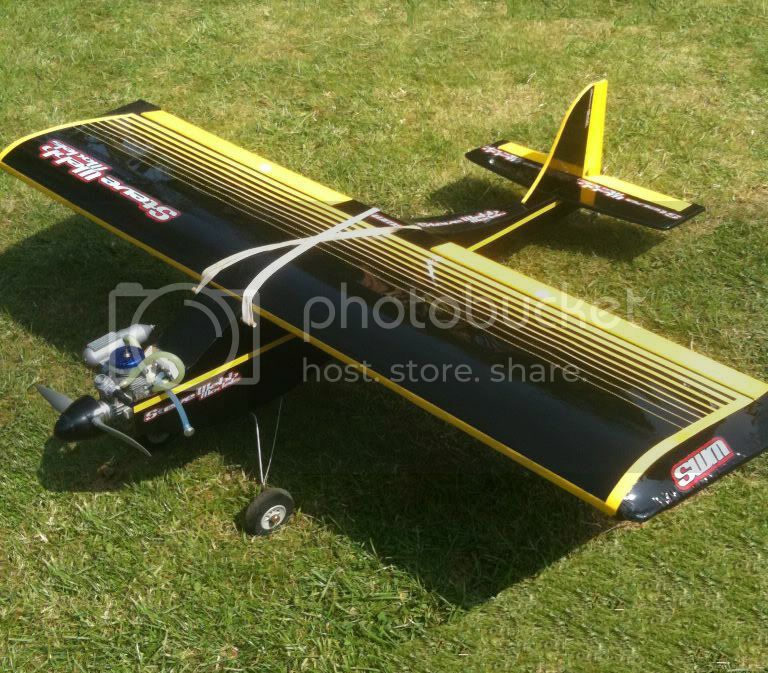 Paul used to have something like a 9 x 4 or 8.5 x 4 and I think when he flew it at Sandown he had the 15 BB TN Enya with a 10 x 3 Graupner Grey prop. The Graupner grey is old school and not as pitchy as modern props. Makes me think that those using a 15 should go for less pitch. I just back pedal'd to Ian's post and he's finding similar - less Pitch and more groundspeed will give a better take off and plenty in the air as it unloads. I should add that the SC 15 loves Nitro. So at 15% you are only just getting going, - Regards fuel a 20 % synthetic/castor with 15 or 20% Nitro would make the SC 15 sing better. Some of the competition 18% synthetics would be even better, but that might leave you with no warranty on a lean run. Some manufacturers want use less that 18% and then only one with a castor percentage. Hope to see all these WebBIts flying on Sunday!